I once read that watching Battleship Potemkin is like seeing the language of film being written right before one's eyes. Owing much to the inventive visual eye of Sergei Eisenstein, it by any measure ranks among the most influential works of cinema ever filmed. Even those who haven't experienced Battleship Potemkin themselves have almost certainly seen it quoted and referenced time and again, particularly the iconic sequence of a baby carriage tumbling down the Odessa Steps, surrounded by trampled, blood-spattered, bullet-riddled corpses. This is the film that all but defined the term 'montage': the editing together of different, distinct images to create a sum that's more resonant than each of its individual parts. Its approach to editing was at the time nothing short of groundbreaking, and its influence cannot be overstated. This isn't at all a film whose appeal is purely academic, though. Battleship Potemkin was expressly designed to stir intense emotions. Drawing further strength from its daunting scale and unflinchingly graphic violence, Battleship Potemkin found itself banned throughout quite a number of countries the world over, each fearing the threat of the political uprising that it could inspire. Eighty-five years have passed since Battleship Potemkin first premiered in Moscow, and time has done little to dull how powerful and engrossing the film remains all these decades later. opportunity to get to know any of the individual men aboard the Potemkin, and that's entirely the point. The hero of the film is not a man or even a small band of men: no, the hero is The Collective. To aim the spotlight towards any direction in particular would only deflate the importance of that sense of unity. techniques: the overlapping cuts of a sailor consumed with anger as he cleans a plate with an ironic message, another sailor looking up at the rafters to see a slew of dangling corpses fade into view, and the juxtaposition of the quiet beauty of the sparkling water of the Black Sea as it shares the frame with Vakulinchik's remains, just to name a few. Battleship Potemkin is a visual spectacle, and despite nearly a century having passed since it was filmed, much of it continues to impress. I'm particularly dazzled by the scale and scope of the sequences in Odessa. There's no way to more effectively convey the power of the collective than to pull the camera back and fill every square inch of the screen with people. These scenes feature seemingly thousands of extras, and it's difficult to imagine any filmmaker in the here and now attempting crowd scenes this ambitious without resorting to CGI trickery. This daunting scale also serves to heighten the horror of the Odessa Steps massacre, one of the most enduring and iconic sequences in the history of film. As masterful as the construction of the sequence itself is, the imagery is equally disturbing and evocative: the sight of the innocent brutally gunned down, the many trampled bodies, a wounded child begging for his mother as blood streams down his face, a woman screaming after a cossack stabs her in the eye with his sabre, untold hundreds of corpses scattered across the frame, a legless begger bounding around in search of safety... This is a sequence that remains unnerving and powerful all of these many decades later, and the impact it left on the art of filmmaking is incalculable. Considering how confrontationally political Battleship Potemkin is, it comes as little surprise that the film has been censored and recut incessantly over the years. Its nature as a silent film allows its message to easily be skewed through the rewording and rephrasing of its intertitles. Some edits muddled key moments to the point of rendering them nearly incomprehensible, and an ill-advised sound version had even been issued. 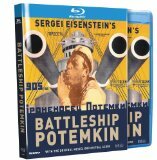 Many versions of Battleship Potemkin have come and gone over the course of nine decades, but the restoration showcased on this Blu-ray disc approximates Eisenstein's original intent far better than any of the many releases that had come before it. As many different edits and revisions as there have been of the film, there have been even more soundtracks. Perhaps the most definitive is the score penned by Edmund Meisel that has been revived as part of this restoration: originally written in collaboration with Eisenstein and thought for many decades to be lost. Care has even been taken to include both Russian and newly-translated English intertitles. Only the disappointing lack of extras prevent this from being a truly definitive release. One hardly has to agree with Battleship Potemkin's politics to appreciate it; this is by any measure a seminal work, and Battleship Potemkin is required viewing for anyone fascinated by the language of cinema. Highly Recommended. This is an astonishingly gorgeous presentation, in much the same league as Masters of Cinema's spectacular silent releases that have dazzled me so much over the past few months. Contrast is consistently rich and robust throughout, and the restoration reveals a level of definition and detail that DVD could never hope to deliver. 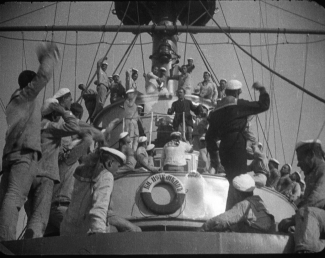 Battleship Potemkin draws much of its power from the scale and scope of its imagery; in particular, the sprawling crowds that define the sequences in Odessa are far clearer and more distinct than anything I'd expect to see in standard definition, and these scenes are more impactful on Blu-ray as a result. The grain structure is also reproduced exceptionally well, and though there isn't any shortage of microscratches on display here, they're not the least bit unreasonable or distracting. I was unable to spot any trace of digital noise reduction, edge haloes, or compression artifacting. 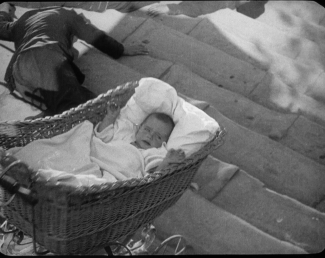 Kino's release of The General -- as amazing as it was -- did suffer from some excessive digital manipulation, but nothing of that sort ever once caught my eye throughout Battleship Potemkin. I'd be impressed by a release this beautiful of any film of this vintage, but especially considering the checkered history of Battleship Potemkin's many different releases and the limited elements available, that this Blu-ray disc looks so stunning is all the more remarkable. Two presentations of Battleship Potemkin are offered here -- I'll touch on why in a moment -- and they're each afforded ample room to breathe on this dual-layer Blu-ray disc. Both have been encoded with AVC. The aspect ratio varies slightly throughout but is generally presented at an aspect ratio of 1.29:1 or so. 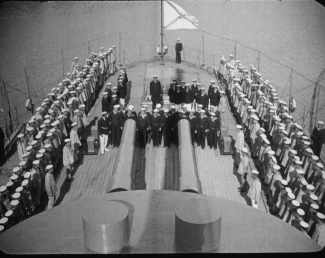 Battleship Potemkin is predominantly in black-and-white, though in this presentation, the Potemkin's raised flag has been handpainted red to more accurately reflect the similar imagery from the film's earliest theatrical exhibitions. The same as the two-disc DVD set before it, Kino has gone to the impressive length of including two versions of Battleship Potemkin on this Blu-ray disc. 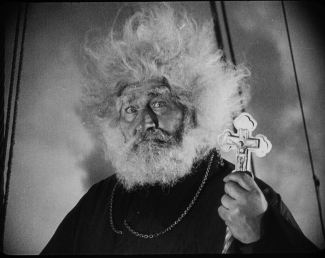 The first features the restored Russian intertitles and the other is a set of newly-translated English titles. For those interested in seeing the original Russian text despite not being fluent in the language, an optional subtitle stream features a transcription of the English intertitles. 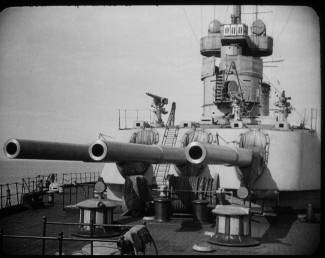 Battleship Potemkin has had innumerable scores attached to it over the years, from the forgettable organ accompaniment at its premiere in Moscow to electronic music performed by the Pet Shop Boys. The first proper score for the film came with its release in Berlin, composed by Edmund Meisel with quite a bit of guidance from Eisenstein himself. Meisel's score was thought for half a century to be lost, but it's since been rediscovered and recreated, and it's a recording of the music he penned that's presented on this Blu-ray disc. The orchestral score is offered here in six-channel, 24-bit DTS-HD Master Audio, and it sounds marvelous. The powerful and robust performance greatly complements the imagery Eisenstein splashes across the screen, and from cracks of gunfire to swings of an axe, the instrumentation cleverly stands in for a number of sound effects. 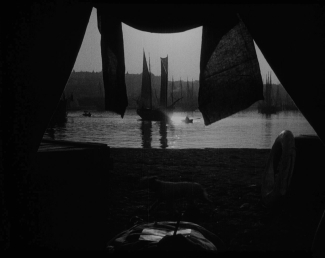 Having now experienced Battleship Potemkin with Meisel's music in tow, I can't fathom watching it any other way. The climax of the film is spectacularly and almost unbearably intense, and that tension is largely owed to the spectacular crescendo to which Meisel's score builds. The distinctness and clarity showcased here are terrific as well: the crisp sound of the snare, the soaring strings, and the resounding low-frequency roar to its percussion. The 5.1 mix is weighted most heavily towards the front mains, though the center and rear channels do help to reinforce the instrumentation. I'm deeply impressed by both the score and its presentation on this Blu-ray disc, and it's very greatly appreciated that Kino went to the effort of offering it as lossless audio at such a high bit-depth. Considering what a seminal film Battleship Potemkin is, it's disappointing that the extras are so sparse. I'd expect that any number of film historians, directors, and especially editors would leap at the chance to discuss Battleship Potemkin if given the opportunity. than explore the production of the film or the impact it left on cinema, Battleship Potemkin's sole documentary delves into the painstaking reconstruction of a film that'd been censored and tampered with so extensively over these many decades. German censors insisted on a slew of cuts, eviscerating most every trace of violence in this unflinchingly graphic film: a list including the execution of Vakulinchuk that's the driving force behind the uprising in Odessa. 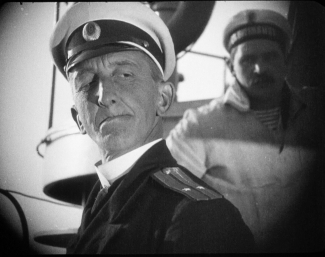 The original camera negative had been recut to accommodate, and it was this censored negative that would be used as the source for many further edits: a run converted for sound that sapped away much of the contrast and detail, intertitles rewritten to match the political winds at the time, the movie being re-edited to better match some Russian symphonies retroactively chosen for its soundtrack, and potentially non-canon shots from a slew of different sources reinstituted back into the film throughout the '60s and '70s in not-entirely-successful attempts at recapturing its former glory. From there, "Tracing..." focuses on the 2005 restoration to recapture Eisenstein's vision as closely as possible, considering the lack of a definitive film record. Quite a number of comparisons between this restoration and earlier releases are featured here, and also explored at length are the recreation of Meisel's simplistic but spectacular effective musical compositions as well as a look at the Potemkin's flag being painted red by hand. 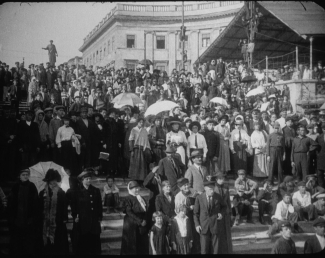 "Tracing the Battleship Potemkin" is encoded in 1080i but has clearly been sourced from standard definition, 4x3 video. This is an international production and is subtitled accordingly. Photo Galleries (HD): The only other extras on the disc itself are three high resolution still galleries. "Behind the Scenes" features twelve photographs, including a look at Eisenstein's stage hair and beard being applied for his brief role as 'The Pope', and there are also quite a few shots of the camera used to photograph the film. A second gallery offers eleven additional shots, including a flyer touting Battleship Potemkin's successful run in Moscow, several posters and assorted promotional art, and a handful of photos of Eisenstein himself. Finally, there are sixteen stills of deleted scenes. These were briefly glimpsed in "Tracing the Battleship Potemkin", but the presentation here is of a much higher quality. The majority of them are devoted to strikes by printers and undertakers, and also featured are extensions to the legendary Odessa steps sequence. Another shot offers a quick peek at the ship's doctor and Eisenstein's 'Pope' dining together. Battleship Potemkin arrives in a sturdy cardboard slipcase, and tucked inside is an impressively well-researched set of liner notes by Bruce Bennett. While these sorts of liner notes would generally focus on the production of a film followed by some sort of critical analysis, Bennett instead devotes the bulk of his comments to charting the troubled and convoluted history of Battleship Potemkin's many different releases the world over. Battleship Potemkin ranks among the most important works in the history of cinema, and it's essential viewing for anyone fascinated in exploring the language and rhythm of film. I was first introduced to Battleship Potemkin through a muddy public domain video in a film class a lifetime ago; even recently having marveled at the spectacular high definition presentations of City Girl and Sunrise: A Song of Two Humans -- two other films of a similar vintage -- I was wholly unprepared to be as dazzled as I am by this world-class restoration. The limited extras are an obvious if somewhat expected disappointment, but Battleship Potemkin is otherwise an exceptional release in every way, boasting a lossless new recording of Edmund Meisel's score, sumptuously gorgeous high definition visuals, and both the original Russian and newly-translated English presentations of the film's intertitles. 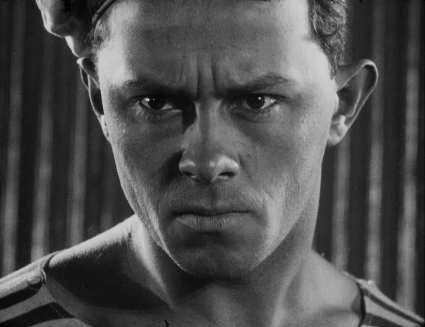 Even though the better part of a century has passed since Battleship Potemkin first roared into the Bolshoi, it remains a powerful and engrossing film, and it's one that demands to be experienced again on Blu-ray. Highly Recommended.